Looking at a smiling, confident Liz Daks today you would never imagine how close she was to despair when she first came to see us. 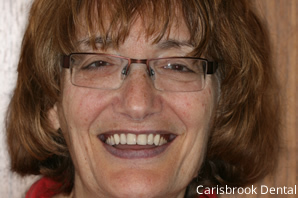 Liz lives in North Wales, not exactly on our doorstep, but out of all the many dental practices she consulted across the UK, she chose Carisbrook Dental to help her regain her smile. As a result of gum disease and tooth decay Liz was left with only three front teeth and when her local NHS dentist informed her that he could do no more for her, she began to search for someone who could! Liz started by Googling: cosmetic dentists and from the list that her search produced she then undertook further research, including arranging consultations with a number of specialist dental practices, some of which were based as far away as London. After coming to see us though, Liz quickly decided that out of all the dentists she had met, Carisbrook inspired the greatest confidence. 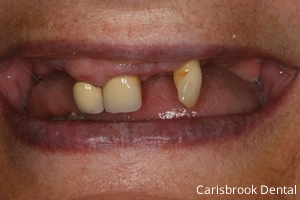 Our recommendation was to use a combination of implants and dentures to restore her smile. Firstly we removed the remaining teeth and inserted four dental implants onto the top and two implants into her lower jaw. 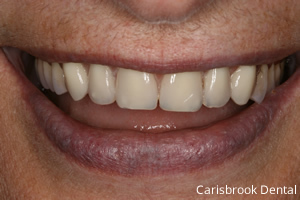 Then, after allowing time for the gums to heal, we manufactured a complete set of bespoke dentures to complement Liz’s mouth and face and these were designed to click firmly in position onto the implants. After years of self-consciousness regarding her appearance and of course experiencing great difficulty in eating many foods, our treatment has greatly restored her self-esteem and of course she is able to smile with confidence and eat virtually anything she fancies. Needless to say, Liz is extremely pleased that she chose Carisbrook Dental to help her and she couldn’t be happier with her new smile. Why not take a look at our Smile Gallery to read about some of our other happy smiling patients? 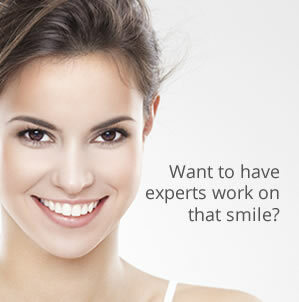 If you would like to discuss cosmetic dentistry we are currently offering, for a limited period, a FREE CONSULTATION. Just give us a call, or click here to fix up an appointment.